In common with the vast majority of players whose inter-county careers were enhanced by participation in the International Rules Series, CiarÃ¡n McManus has a wealth of happy memories from playing against Australia in home and away tours. Memories of particular games may fade in time, but what will endure for him - and all who had the privilege of touring down under - are the friendships forged with players from all over Ireland. In his case, that was guaranteed because of the longevity of his involvement in the series, stretching from 1999 to 2005 - which meant that he played in seven series.That encompassed the grand total of 14 test games, a feat all the more noteworthy for the reason that he is the second most 'capped' player behind Derry's great Sean Marty Lockhart. Their careers overlapped and after Sean Marty's participation in the last 'home' series in 2006, he retired with 16 appearances to his credit. CiarÃ¡n was one of eight players from Offaly who represented Ireland, (with Matt Connor and Richie Connor involved in the inaugural series in 1984) and together they garnered 27 caps. Over the course of his career, he was on the winning side in six games, lost the same number and was involved in the only two draws. His competitive debut came in Australia in 1999 in the MCG (Melbourne Cricket Grounds, where Ronnie Delaney won his Olympic 1,500 metres gold medal in 1956). In different circumstances it could have happened for him in Croke Park twelve months earlier. Colm O'Rourke was in the first year of his (two-year) term as Irish manager and he was interested in bringing CiarÃ¡n in for a trial game. "At the time, I was in America with a few more teammates (after Offaly had been knocked out of the Leinster championship at an early stage). My mother phoned to say that I received a request to attend the International Rules trials,'' he recalled. While different Irish managers invariably picked their strongest fifteen players to start, this wasn't always the case.Very often strategy would dictate that players would be held in reserve, which meant that that those on the bench were not 'subs' in the normal meaning of the word, but inter-change players who were brought in and out of games according as required. in fact, he was involved in a vital move which produced a goal which ensured a dramatic victory. Actually, it looked like the goal (six points) was not going to be allowed because the score was taken off the board. But, after a short lapse, it was put back on and so Ireland gained a famous victory. It was to prove significant, because a draw in the second test in Adelaide meant that O'Rourke became the first man to manage winning teams in consecutive home and away series. 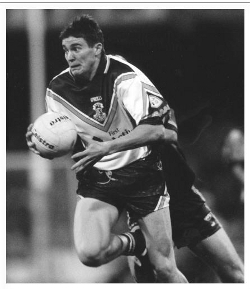 The fact of being retained in the squad for each of the next six series (working under managers Brian McEniff, John O'Keeffe and Pete McGrath) was testament to his prowess in the game. He displayed all of the qualities which, simultaneously, helped further establish his reputation in the inter-county arena. In 2000, Australia won both tests in Croke Park and Ireland did likewise in Melbourne and Adelaide the following year. Australia won the first test in Croke Park in 2002 (with the second test ending level) and after losing the first game in Perth in 2003, victory for Ireland in the MCG a week later wasn't sufficient to wipe out a ten points deficit. myself for the simple reason that I thought I had the hang of the game pretty well. Once I got more established in the team I could enjoy the game more.There wasn't as much pressure to learn the game as such, you could focus on playing your best and most importantly winning,'' he explained. His last test appearance was in the MCG in 2005, notable for the fact that the Australian captain Chris Johnson was able to receive the trophy despite having been red-carded after an appalling incident in which he tackled two Irish players around the neck. CiarÃ¡n recalled that there was 'a small bit of bad blood' following the first test in Perth, when Colm Cooper 'was nailed' shortly after he came into the game. "It sickened the whole lot of us,'' he said. "It was unfortunate.We really wanted the Gooch to have a good series, but they ruined his appetite for the game. Agreeing that it was hard to explain the turn-around from 2004 (Ireland going from a 50 points victory to a 57 points defeat), he put it down to the Australians recognising the need to get away from relying on big men to outmuscle the Irish. "What I did notice as the years progressed was that Australians picked more and more runners, more and more footballers. In fairness, they 'upped' their game every year, this in turn upped the challenge for us. "The Irish teams' fitness levels had to keep going up and up to match them.The last time I played they took it to an all-time high with regard to running us into the ground. Sean Boylan (manager in 2006 and 2007) picked up on it.We had to use runners more and more to stay with the pace of the game. Ever since he broke into the inter-county scene, and from his days in UCD, CiarÃ¡n has been renowned for his combative style, the way his power and physique enables him to compete so strongly, how his speed and ball-carrying ability has always set him apart as a footballer. Interestingly, in the tour booklet prepared for the 1999 series, his profile noted that he had been central to the re-emergence of Offaly as a football power since making his senior debut in 1966. It added:"an excellent fielder of the ball, he is also a strong runner and likes to be at the centre of the action...'' In essence, he thrived on the 'rough and tumble' of the International Rules Series and relished the challenge of proving himself on a continual basis against professionals who represented the cream of Australian Rules. He outlined his approach in a 2004 interview with Christy O'Connor in the Sunday Times, when he said:'I'll do what I have to do.There's no one more nationalistic that an Australian and they'll do what they have to do.You have to respect that, but I don't care what they do. With Offaly he won Leinster championship and National League medals in successive years (1997/'98). And, while 'things went down' after that, he had been given what he describes as 'a great springboard' on to the football scene. First it was Leinster and then it was Ireland. "Once I got my foot in the door in the International Rules I had to make a name for myself. The best thing about the game - and every player would tell you - is that you have to prove yourself every year.And, if you were there the year before you had to prove that you had got better, that you had learned something from the game. Along the way he developed lasting friendships with players from all over the country. In particular, he relished the opportunity to meet with players from the northern counties.And, he encountered some of the biggest names in Australian Rules, the like of Nathan Buckley, for instance, one of the best ever to play in the series.